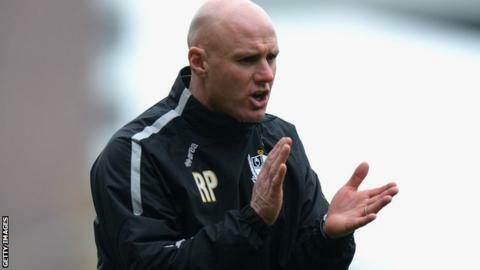 Port Vale manager Rob Page says his decision to keep players such as Chris Birchall and Adam Yates at the League One club has been justified by recent performances. Midfielder Birchall, 31, and 32-year-old defender Yates, signed one-year contracts in the summer. "They're the sort of characters you want in your dressing room," Page, 41, told BBC Radio Stoke. "They're not here for the money. In fact, they've taken a pay cut to stay." Trinidad and Tobago international Birchall returned to Port Vale in 2013 after starting his career with the club. Yates, who was unhappy about losing his number two shirt this season, joined Northampton Town on loan in August but got injured and played his first game since September as Vale won 2-1 at Barnsley on Saturday. Page continued: "I thought he was great - considering he's not even been in our 18, we put him out on loan to Northampton, he got injured and has come back. "But credit to the lad - that's why in the summer I had the opportunity to keep players like 'Yatesy', knowing I could trust him and he'd go in and do a job. "'Birchy' and 'Yatesy' have got vast experience and fantastic characters." Have Vale turned the corner? After beating Sheffield United 2-1 in October, Vale lost four and drew one of their next five games in all competitions. Saturday's win at Oakwell was their first away from home since September and was their second successive victory, lifting them to within four points of the play-offs.